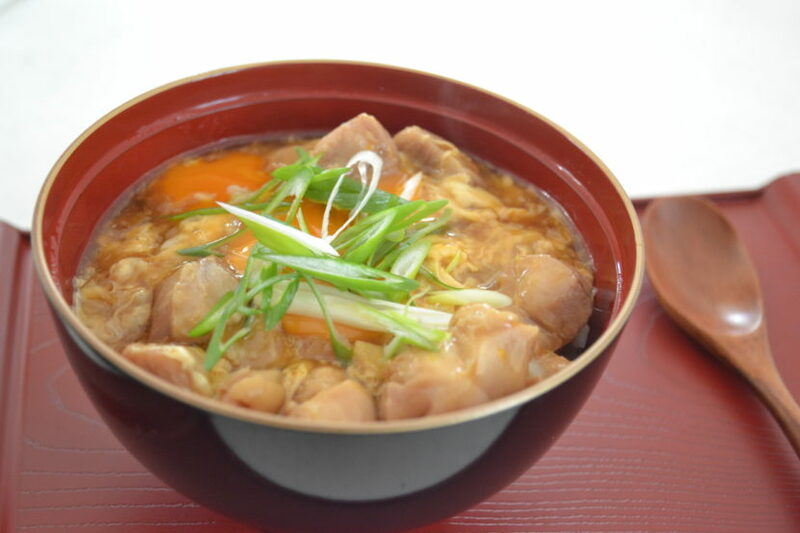 Today, I’m going to show you how to make “Oyakodon”. This is a very popular “Donburi” which means rice bowl. We eat this tasty donburi as a quick and easy lunch at casual restaurant. But you can make it at home easily. OYAKO means parent and child in Japanese, in this dish, OYA is chicken, KO is egg. Usually, we cook OYAKO-DON in a specialized shallow pan for each serving. But it is not efficient at home. When the last person served his or her donburi, the first person finish eating. I don’t want that. So, the recipe is my take, but it turns out great to serve the whole family at the same time! The secret ingredient is “potato starch”. In Japanese cooking, we constantly use “potato starch” as a thickening agent or dredge for deep frying. You can substitute for cornstarch, but the final product is not the same texture. So I highly recommend having one if you find at a Japanese supermarket. 1. Slice scallions into the thin diagonal cut. Set aside. 2. Next, scrape the skin of ginger, and grate. 4. Transfer chicken to a tray sprincle a pinch of salt and a splash of sake. Toss to coat. I always do this step to remove the gamy smell of chicken. 5. Bring 2 cups of water in a medium size pot and put your chicken into it. When the surface of the chicken turns to white, drain into a mesh strainer. This step is called “Shimofuri” in Japanese cooking, make your dish taste clear and beautiful. You can skip the process if you don’t have a time. But you have to skim the scum while cooking. 6. Pour dashi into a medium size pot and bring it to a boil. Add mirin, sake and grated ginger. If you want to make single serving or big batch, adjust the amount of broth according to the ratio! 7. Add prepared chicken and cook 4 to 5 minutes or until done. 8. Stir in water dissolved potato starch to thicken the broth. 9. Beat 3 eggs and pour slowly into the pot. Give it a gentle stir and turn off the heat. Cover with a lid to cook the egg nice and soft. 10. Scoop cooked rice into the serving bowl, and pour the chicken mixture over the rice. Make an indent and top with very fresh egg yolk and scallions. Put the lid on to serve. Let’s taste! My son just comes home and he is so hungry. What a Big bite! The rice mixed with savory thick sauce, bouncy chicken, soft cooked egg, this is so tastey! Give it a try!